This interview was really really good because this time Spencer did actually get to the point when it comes to time lines and upcoming stuff. Also it seems that the possibilities of Acell are not even reached by now:lookaround: and that Hitzig is really into it. Aso if you read in the message boards you can see that Cole remains sceptic (it seems its his nature) but on his homepage he talked about the reality of regrowth in donor when follicles are transected. If we pay attention to his interviews the more and more it seems that Acell is really the thing which works as a kickstarting device and it can seriously stop hairloss forever. The pictures after one year with the PRP Acell treatment could as far as i think improve over the next months because it seems that hair needs his time to regenerate itself back. This is more then just good news because it underlines one thing “Infinite donor or regrowing hair” is NOT Sci Fi nonsense. But fine tuning has to be done. And in this Interview Hitzig admits that in the past a lot of researchers were on the wrong track (including him). Which was the most saddening part to hear actually because if in 1998 research would be on this level of today, well i can say for sure that hairsite would not be called hairsite and this board would not be called hairloss boards. And yes i think this is really sad to hear. But luckily right now everything seems to be on the right track and the lost years can get bashed away. We all should be lucky that our hair is complex but in some way stupid aswell or otherwise we would be really screwed. And Dr Hitzig mentioned one important thing " if you have hair left, you can get it back" and he thinks if you are blank and shiny it wont work. BUt thats the thing were i actually disagree with him because right under those circumstances if you would “damage” the shiny top of a NW7 and inject Acell and plasma/stem cells, the chance of regeneration would still be given BUT it would take longer. It must be funny to talk with himself - am I right? I don’t know whether Dr. Hitzig is onto something or not. But he comes across as a genuine person who’s into the science of hair restoration and not just in it for the money. » not just in it for the money. My gut is telling me hi is in for a far greater reach because otherwise i couldnt explain why he is reaching out to other “pharmaceutical” industries. And also Dr Cole is only sceptical about autocloning and not of infinite donor or the benefits of Acell. And at his scepticism he always says “more evidence” so with all his ego boosting and scepticism he is not bashing it completely to the ground. And one joke was really really good " Well you can save money on colour" ok that was actually a really good one. And i compared this interview with other interviews from some months ago and what can i say, he was right with the magic quarter machine where you put in money and you win. Cause now when we look at the pictures and hear people talk about Acell use, well its not just a coincidence any more. It seems Acell is really ignoring mother nature and/or all the factors who keeps your hair from growing. And as he said you wont get a full head of hair DIRECTLY after your first injection. This should be clear BUT everyone can get their original density back thats for sure. We had extensive discussions with Dr. Cooley. I like sharing, and doctors who share information are ethical doctors. 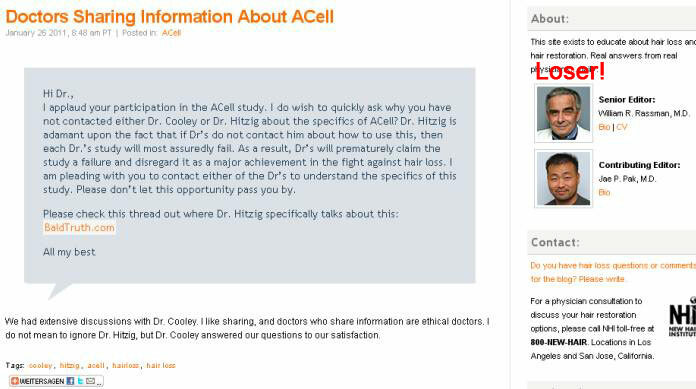 I do not mean to ignore Dr. Hitzig, but Dr. Cooley answered our questions to our satisfaction. Maybe he is sabotaging it but you keep on focussing only on the bad things everywhere and toally gt lost when it comes to the good things. As long as baldies stick together and demand more effort in the search for a cure, then there will be cure within very few years. And another advice to readers in general. If people RIGHT now in the Year 2011 say “10 more years away” they are obvious lying because with treatments of today, at least its possible to transform a NW5 to a NW1 including perfect density even when it comes to wet look. Everyone wants to be the first on the market to write HISTORY cause they all sure know that the demand for infinite donor exceeds their current demand and thats the point why some docs keep it quiet which is sad at least. » treatments and maybe it too will lose its effectiveness over the years. Iam disagree with Dr Hitzig on this case because techniqually if you would damage the skin and the follicles even on a shiny plate and inject acell and stem cells for example it would form new hairs or working follicles. I think that we need less interviews and more photos of success stories. Interviews lead to nothing (search for the same kind of interviews 10 years ago). » I think that we need less interviews and more photos of success stories. But fine tuning has to be done, as you have heared Hitzig say around 2 years. » » I think that we need less interviews and more photos of success stories. Otherwise it turns into another Gho story. » Otherwise it turns into another Gho story. Yeah agress but unlike Gho, Hitzig, Cooley and Cole are more transparent and they say exactly what they wanna do next where Gho is just doing…well what is he doing exactly, i DONT know. » » Otherwise it turns into another Gho story. » doing…well what is he doing exactly, i DONT know. has anyone dreamed of a job in the hair restoration industry but felt you dont have the right qualifications ? well your dream can now be reality because anyone can be part of this lucrative deciteful industry. whether your a janitor or the CEO of a fortune 500 company your new career is waiting. » » » I agree. » » » Otherwise it turns into another Gho story. » » doing…well what is he doing exactly, i DONT know. » dont have the right qualifications ? » fortune 500 company your new career is waiting. There is nothing new concerning this to report. There is still a ‘shady’ group underway who just try to discredit Dr. Hitzig. woah i did not know that hitzig was involved in that type of shadey business. he came across as a genuine fellow when interviewed on the bald truth radio show recently. don’t know what or who to trust anymore. » and stem cells for example it would form new hairs or working follicles. how do you now that? have you tried? Just wondering what puts you in a position to make such a claim? » actually get to the point when it comes to time lines and upcoming stuff. » now:lookaround: and that Hitzig is really into it. » of regrowth in donor when follicles are transected. » seriously stop hairloss forever. » time to regenerate itself back. » were on the wrong track (including him). » aswell or otherwise we would be really screwed. » given BUT it would take longer. What a lame interview and always the same: Kobren has no idea what to ask and Dr. Ziering is just a hair transplant doctor - not even a good one. Outcome: The same lame discussion like a discussion between two hysteric users in a hair loss forum, who have no clue about anything. » and Dr. Ziering is just a hair transplant doctor - not even a good one. » users in a hair loss forum, who have no clue about anything. You’re absolutly right dude. We would much rather them talk in riddles and post links all day long to useless crap about Master Gho.